Perhaps you've seen the gigantic scoop at Miners Memorial Park in Morgan County, perhaps not. For those that have visited the site, they can attest to the size of this single piece of mining equipment that was once part of a gigantic coal mining operation that stripped veins of coal that was about 100 - 200 feet below the surface from eastern Ohio's expansive coal fields. Dragline mining is a method of open pit mining, some call it strip mining since everything above the vein of coal is stripped away from the surface. Big Muskie's 220 cubic yard bucket was used to removed that top layer of soil and rock above the veins of high-sulfur coal. Then smaller sized equipment would come in and remove the coal. This type of equipment is used throughout the world in both large and small mining operations. 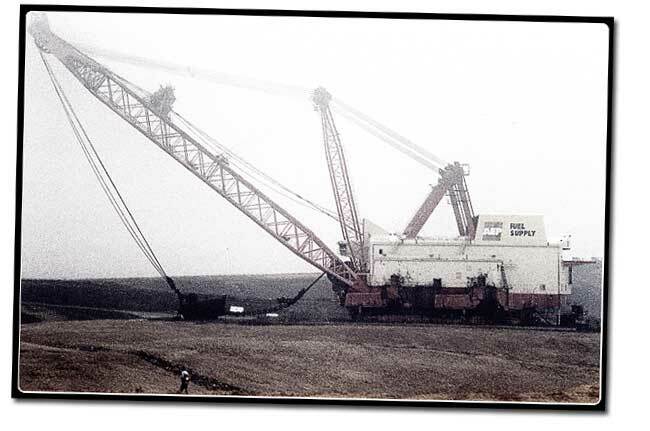 The largest piece of dragline equipment was located in eastern Ohio and was known as Big Muskie, named after the Muskingum River that passes through Morgan and Muskingum Counties. Today, the bucket is all that is left from the dismantled dragline excavator. Construction of Big Muskie began in 1967 and started operationg in 1969. The behomoth machinery was as tall as a 20 story building, with its operator sitting some 5 stories off the ground. 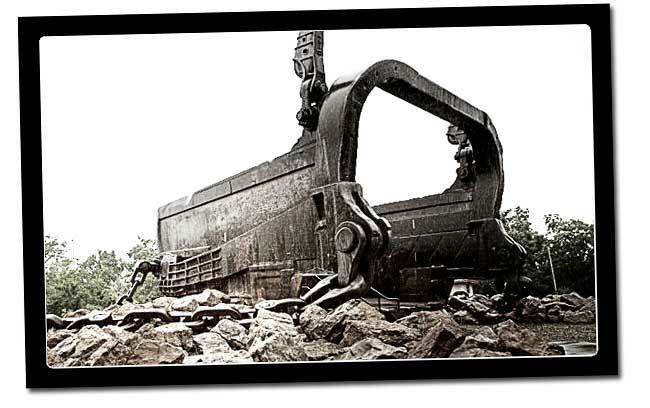 Unlike smaller excavators, the massive dragline equipment ran on electricity, enough to power a small town. It had no treads to move about, but instead had hydraulic feet that were used to slowly move the equipment (it could take several days to move just a mile). During its 22 years of service, Big Muskie moved more than 4.8 million cubic yards of dirt. Big Muskie was in service up until the early 1990s when operating costs and demand for high sulfur coal waned forced the closing of the mines in eastern Ohio. Big Muskie was owned by the Central Ohio Coal Company (once a division of American Electric Power). It was built by Bucyrus-Erie located in Wisconsin, but was originally located in Bucyrus, Ohio. In a typical cycle of excavation, the bucket is positioned above the material to be excavated. The bucket is then lowered and the dragrope is then drawn so that the bucket is dragged along the surface of the material. The bucket is then lifted by using the hoist rope. A swing operation is then performed to move the bucket to the place where the material is to be dumped. The dragrope is then released causing the bucket to tilt and empty. This is called a dump operation. Once mining was stopped, Big Muskie remained a tourist attraction for a number of years until legislation required the equipment to be completely dismantled and removed. There was an effort to save Big Muskie, but those efforts failed except for saving Big Muskie's bucket which now is all that remains of the equipment. The Wilds which opened in 1994 was created from 10,000 acres of reclaimed land from where Big Muskie operated. From I-77 at the Caldwell exit, take SR 78 about 16 miles to Miners Memorial Park, a small park with a pull-off area and picnic tables.